On a Par-3 a player's second stroke leaves their ball at rest overhanging the hole. Which of the following statements are correct? i) ....as soon as the ball comes to rest. ii) ....when the player reaches the putting green without unreasonable delay. iii) ....when the player reaches the hole without unreasonable delay. c) In the above circumstances, what is the player's score if the ball falls into the hole 35 seconds after he reaches the hole? a) iii) ....when the player reaches the hole without unreasonable delay. c) The player is deemed to have holed out with their second stroke but has to add one penalty stroke to make a total score for the hole of 3. When any part of the ball overhangs the lip of the hole, the player is allowed enough time to reach the hole without unreasonable delay and an additional ten seconds to determine whether the ball is at rest. If by then the ball has not fallen into the hole, it is deemed to be at rest. 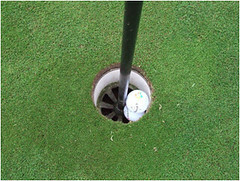 If the ball subsequently falls into the hole, the player is deemed to have holed out with his last stroke and must add a penalty stroke to his score for the hole; otherwise, there is no penalty under this Rule. A player putts their ball into the hole without removing another player's ball already at rest in the hole. Their ball did not therefore touch the bottom of the hole-liner. Was the ball holed? Yes. The ball was at rest below the circumference of the hole. 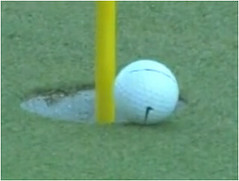 A player's ball pitches straight into the hole, hits the bottom of the hole-liner and bounces out. Has the ball been holed? No. The ball must be at rest in the hole. (This is the favourite ruling of a fellow Club member of mine. He assures me that it actually happened!) Following a putt from the putting green a player's ball was dropping into the hole when it landed on a frog that was taking a rest inside the hole. Naturally, the frog hopped out of the hole and deflected the ball away. a) Was the ball holed? a) No. The ball was never at rest in the hole. b) The stroke is cancelled. The ball must be replaced and replayed. Rule 19-1b. Note: In question 4 if the ball had been played from off the putting green the ball would have to be played from where it came to rest. A ball is holed when it is at rest within the circumference of the hole and all of it is below the level of the lip of the hole.